Albuquerque: University of New Mexico Press, 1984. This is the 1984 paperback reprint edition of The Spell of New Mexico edited by Tony Hillerman. 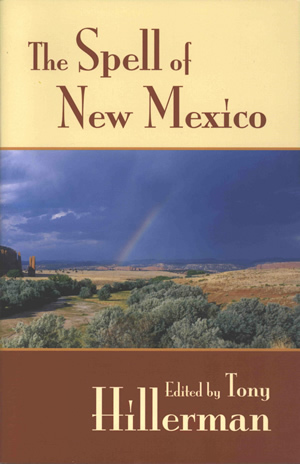 Published by the University of New Mexico Press. The cover design is by Melissa Tandysh and features a wrapping photograph by William Stone of the Venus Needle on the Navajo reservation. On the spine, "HILLERMAN" is printed in the tan top section, the book title over an opacified section of the cover photograph, and the UNM Press colophon is printed at the bottom in orange on red.